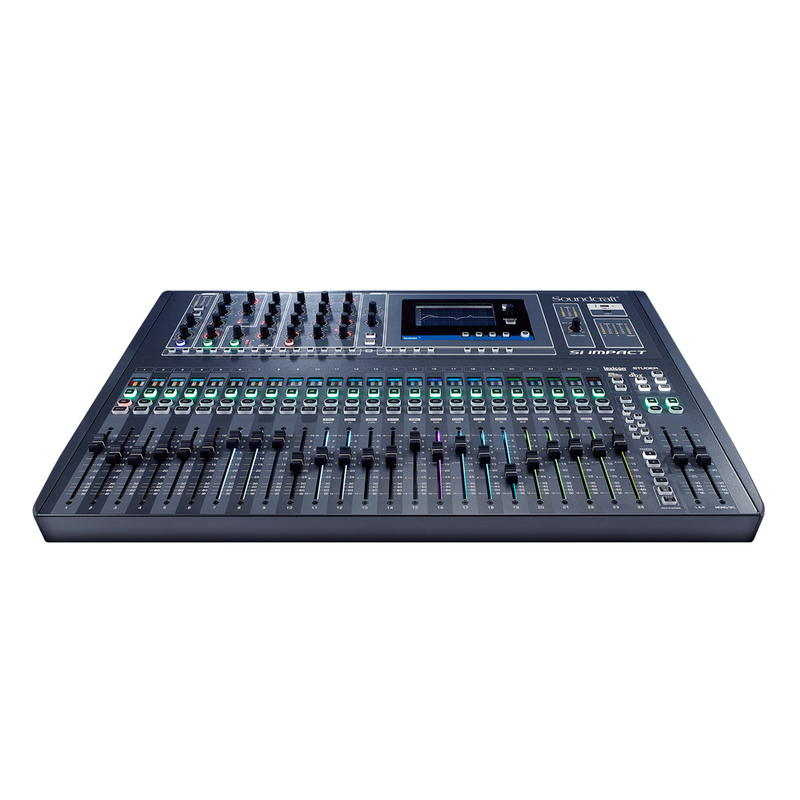 Designed to be as simple as an analog mixer, but offer radical workflow enhancements such as the unique FaderGlow™ system, massive DSP power, and a pristine 32-in/32-out USB audio interface, Si Impact delivers digital live sound mixing and recording for those who refuse to compromise on audio quality. From humble beginnings in London more than 40 years ago and still designed and engineered in the UK, Soundcraft defined the term 'British sound' in live sound mixing consoles. Soundcraft Co-Founder Graham Blythe's acclaimed microphone preamps and 'British' equaliser ensures the Si Impact proudly carries Soundcraft's signature sound today. Combining One-Knob-One-Function control with unique features like FaderGlow™, Soundcraft combines analogue workflow with digital flexibility. FaderGlow™ illuminates the fader track in different colours to provide at-a-glance status information on precisely what the fader is controlling – aux sends, FX sends or even the graphic EQ that's available on every bus. Each fader channel also features a clear multi-color LCD display - giving 'at a glance' information on levels and offering a fully customisable'scribble strip' to name your channels. 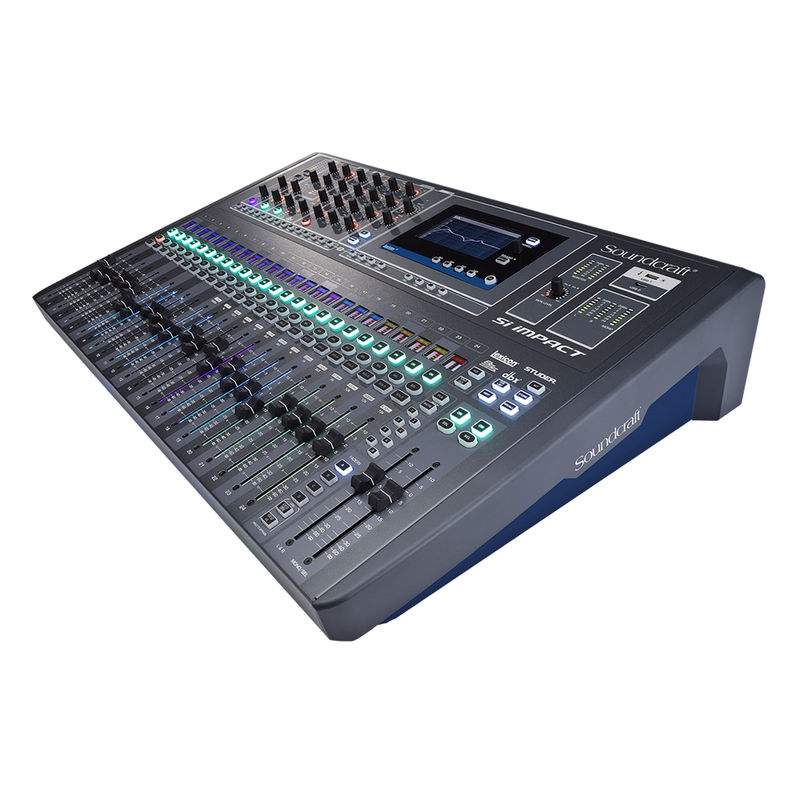 With built-in connectivity for an optional Soundcraft Stagebox, Si Impact lets you put your I/O where you need it. 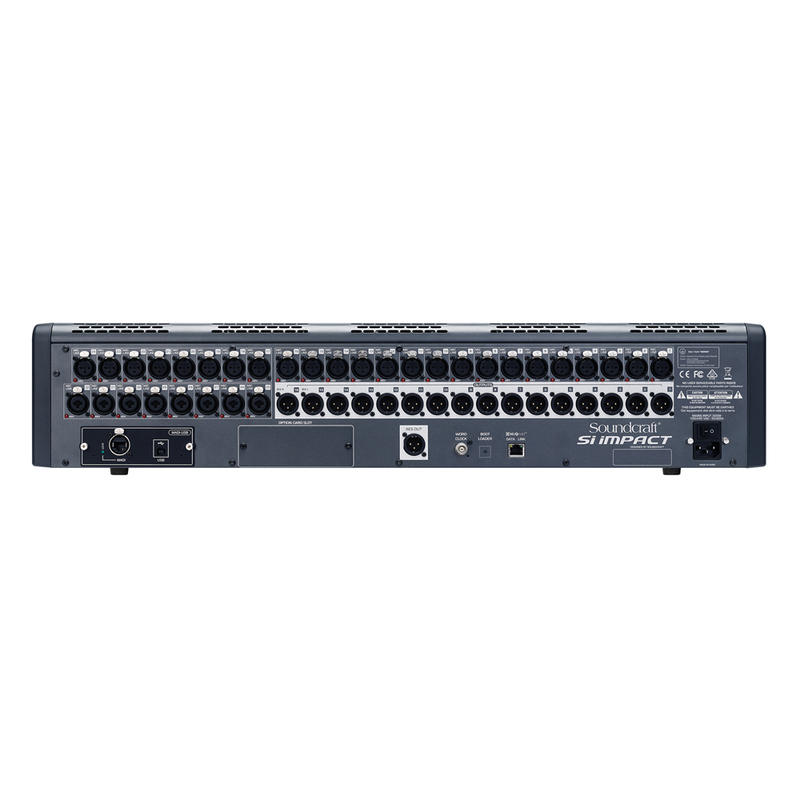 Set up your Stagebox by the band for live sound applications, or position it in the live room for studio recording all via a single piece of Cat 5 cable. Si Impact makes recording quick and easy with superb quality, built-in 32-in/32-out USB recording and playback – and a free download of Ableton Live Lite 9 is included. A single connection to your PC or MAC and you're ready to make multi-track recordings direct to any digital audio workstation. Send up to 32 inputs and 32 outputs to and from your DAW for recording and playback. 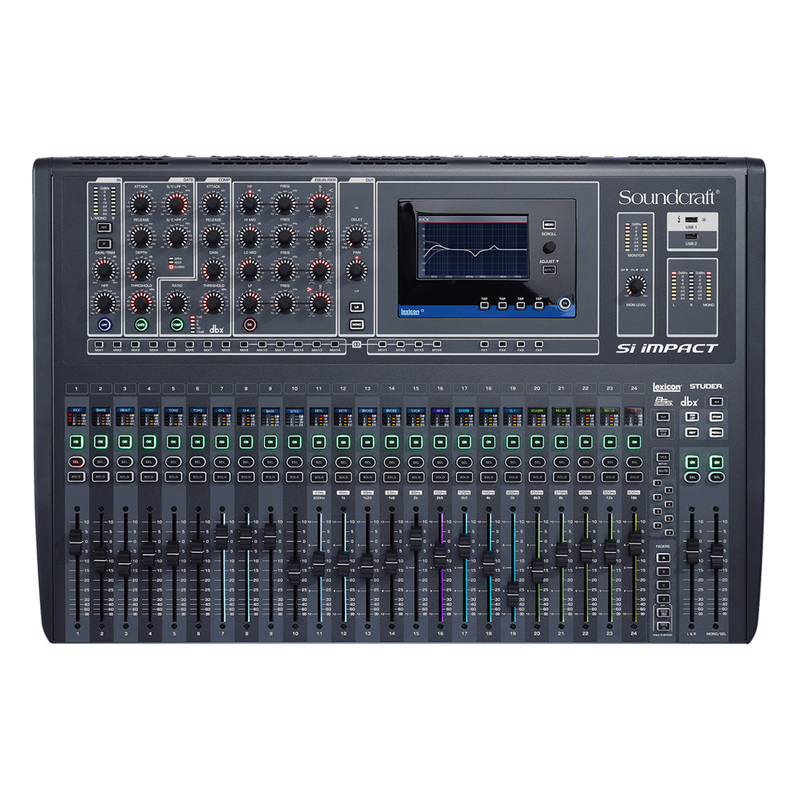 The mix power of Si Impact is accessible from anywhere in the venue, via the Soundcraft remote iPad® app. Mix FOH from the audience location, mix monitors from the stage, or allow musicians to set their own monitor mix from multiple iPad® devices. 48kHz +/-7Hz (internal systems), +/-3Hz with stageboxes.